Diana Cohn’s ¡Sí, Se Puede! / Yes, We Can! ¡Sí, Se Puede! / Yes, We Can! 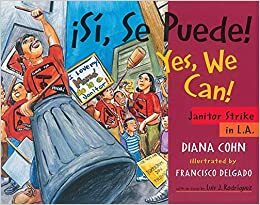 (2005), a bilingual text written by Diana Cohn and illustrated by Francisco Delgado, explores the Los Angeles Janitor Strike of 2010 from the perspective of a family participating in it. The text opens with the mother of a young boy, Carlitos, tucking him into bed before she leaves for work. The boy’s bedroom is tidy and bright, and Delgado’s bold and detailed illustration captures the young boy’s sleepiness and his mother’s love as they share a glance. In the next image, it is Carlito’s mother who is sleepy. She is depicted mopping floors in an empty office building, eyelids heavy, as she completes critical but invisible labor. The following morning, Carlitos’ mother is back at the kitchen table, as always, waiting to greet Carlitos when he wakes up. She walks him to the bus before heading home to sleep. Although mother and son are not able to spend as much time together as they would like, Carlitos’ abuelita is present to help raise the young boy. The family of three take good care of one another, providing the reader with a strong image of intergenerational love and support, which is rarely foregrounded in children’s books focused on white families, but is often present in work by people of color and new immigrant literature. The cycle of work, sleep, and a little bit of family time, is broken one night when Carlitos’ mother sits the boy on her lap and explains that she cannot take care of him and his abuelita the way she wants to. Even with working extra jobs on the weekend she cannot afford abuelita’s medication. Far from trying to protect Carlitos from the reality of their lives and the social world they inhabit, Carlitos mother explains that her full-time job as a janitor is undervalued and underpaid. Carlitos understands that his mother will join other janitors to strike for more money and better work conditions. The next image, and several subsequent ones, are of his mother and other community members on strike. Carlitos’ mother is proud of her work and every night she reads him newspaper articles about the strike. Carlitos is, in turn, proud of his mother. One day he clips out the newspaper articles and takes them to school. The classroom is adorned with a “Viva Cesar Chavez” poster, and once the children pass the articles around and start discussing the strike they realize many of their family members are involved. Their teacher, Miss Lopez, shares a personal story about her grandfather being treated “just as if he wasn’t a person” when he came to the US as a farm worker. She explains how, like the janitors, farm workers united to demand a better life, and that their demands were met. Sharing stories about their personal stakes in the strike as well as Miss Lopez’s story of her grandfather’s success, encourages the children to feel like members of a community who can demand change, not isolated individuals whose experiences of poverty and prejudice are the cause of personal or parental shortcomings. At home, Carlitos’ mother continues to share stories about the strike, her pride in participating, and awe of the community outpouring of support. One evening, Carlitos sees his mother on TV giving a speech and his pride in her encourages him to find a way to participate. The next day he tells his teacher he wants to join the protest against poor wages; many students decide to make posters and join the protest as well. In class, they paint signs demanding justice for janitors and celebrating the important labor they do. Carlitos’ sign reads “I love my Mama! She is a janitor.” The following day, Miss Lopez brings several students on a bus to the downtown LA strike. When Carlitos’ mother sees the children she is so happy she holds back tears. Within a few weeks the strike ends, successfully demonstrated the power of community. Following the strike, Carlitos has a happy dream that a band of mustached angels are singing to his mother as she works. Importantly, Cohn makes clear that when the lives of workers are improved the lives of families are improved. She write: “Now my mama smiles a whole lot more. Abuelita’s sore bones feel so much better. She walks with Mama and me to the school bus in the morning. Mama no longer has to clean houses and wash clothes on the weekends. Instead, we go to the park and on our way home, she lets me buy a paleta or a churro from the man who sells sweets on the corner.” In this story of family members and community taking care of each other, lives are seen as richly interconnected. Although the text could easily have ended here, it doesn’t. The lesson of community is reiterated at the text’s close. On a Saturday morning, Carlitos’ mother receives a phone call from a person who cleans hotel rooms. Her friend is interested in striking for better pay. Mother informs son that she needs to help the new strikers as others helped her. Later that day, as she heads for the door, Carlitos runs after her, protest sign in hand. This is a great book. It’s sure to encourage thoughtful discussion among readers. I particularly appreciate Cohn’s focus on Carlitos’ perspective, which allows her to represent children as agents of social change, community members, and emotionally literate family members. Even more, I enjoyed her subtle ability to show the complexity of labor, particularly invisible labor, like that of nighttime janitors, which is easy to ignore until we are forced to look at it. A very smart text, I certainly plan on adding it to my library, and recommend it for yours. You can purchase this on Amazon for under $4!